Ruthiebear (Titusville, NJ, United States) on 22 December 2016 in Lifestyle & Culture. I must attend a funeral today so will catch up tomorrow. Jolie désaturation qui met bien cette boule rouge en valeur. Quelle boule et décoration quel reflet et effet sueprbe. Such a stunning spotlight on the red and the foliage in black and white frames the bauble so well. such beautiful composition, focus, selective color, lights & bokeh! Red is the top color of this season ! Superbe, que j'aime ta photo chère Ruth, tout à fait magnifique!!! Gros bisous et bon jeudi tout en douceur! 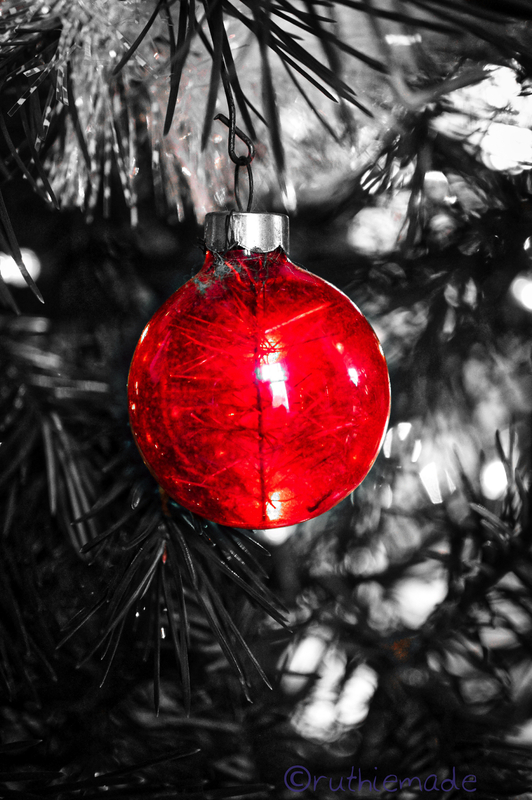 The spot color of this pretty ornament makes it dominate the picture very well. Excellent photo. Beautiful shot of the red ball. Great selective coloring to make this really "pop"! !